Monin Blueberry (Myrtille in French) syrup in stylish 70cl glass bottle. Blueberries are native to North America. For centuries, they have been gathered from the forests by Native Americans and consumed fresh or preserved. Featuring a velvety deep-blue colour, blueberries have a sweet taste when ripe, with a light tartness. Enjoy the great, versatile blueberry flavour of Monin Blueberry. 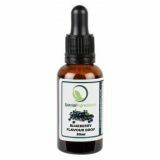 Taste: Wild blueberries smell; sweet, natural blueberry juice flavour. Applications: Cocktails, sodas, lemonades, fruit punches, smoothies, teas. Sugar, water, concentrated blueberry and other fruit juice, flavouring. Total fruit juice: 30% minimum including 16% blueberry juice.